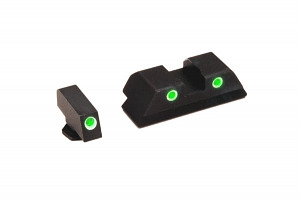 The Ameriglo Classic line is designed for those who prefer more traditional style night sights. Machined from solid bar stock, the Classic line is extremely rugged and durable, with easy to see tritium tubes surrounded by bright white outlines for fast target aquisition in bright and low light situations. Fits Glock 17,19,22,23,24,26,27,33,34,35,37,38,39.